I’m a little late to the party celebrating Massachusetts Maple Month—but at least I can offer a small contribution. 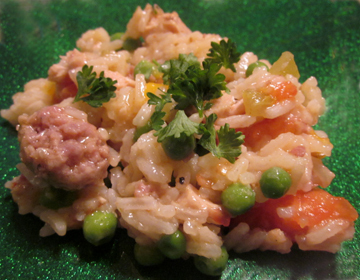 Sometimes the simplest recipes are the best. Sometimes they’re also the only ones for which a home cook has the time and the ingredients. I originally hoped to share my friend Pat’s prize-winning recipe for maple lace cookies. Our extended family was coming to dinner Saturday evening, and I was all set to make these wafers—or so I thought. Unfortunately, I couldn’t find the key ingredient in my pantry: maple sugar!! 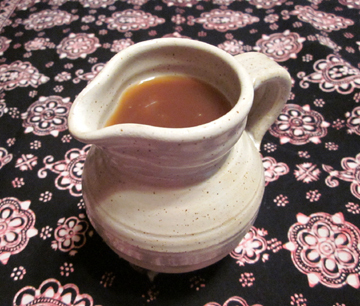 So I punted and made a maple-based sauce for ice cream instead. 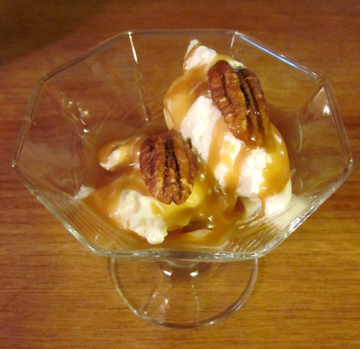 Very rich and very sweet, it works beautifully poured in small quantities over ice cream. Toasted walnuts or pecans make a festive garnish. 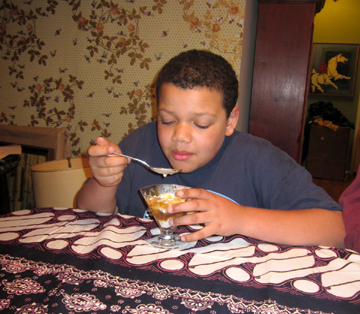 My nephew Michael had no trouble finishing his maple buttersotch sundae. In a 2-quart saucepan over medium heat melt the butter, stirring constantly. Add the brown sugar and stir until it melts. Continue to stir or whisk as the mixture comes to a boil. Boil for 2 minutes, stirring constantly. Whisk in the maple syrup. The mixture will look a little weird at first, but it will come together eventually! Return the mixture to a boil, whisking constantly, and boil it (still whisking!) until it coats a spoon. This took about 3 minutes on my weird electric stove. Makes just over 1-1/2 cups. I love Saint Patrick’s Day. As I noted a couple of years ago on this blog in a discussion of my unsainted great-grandmother, I’m only marginally Irish. Nevertheless, I’ve always embraced this holiday. It’s cheerful at a time when the landscape in my beloved New England is gloomy. It’s associated with any number of popular Irish and Irish-American songs. Some are humorous, such as “Who Threw the Overalls in Mistress Murphy’s Chowder” and “Harrigan.” Only George M. Cohan could have constructed the interior rhymes in the latter. Others are sentimental to the point of being maudlin. Since a lot of beer is drunk on this holiday no one objects. 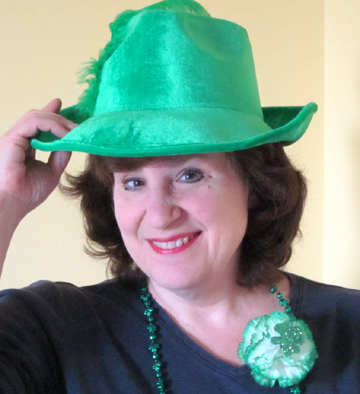 I also love Saint Patrick’s Day because I look fabulous in green. And because I love, love, love soda bread. I’ve already posted recipes for white and whole-wheat soda bread. This year I’m using a recipe cribbed (with thanks!) from Cabot Cheese. 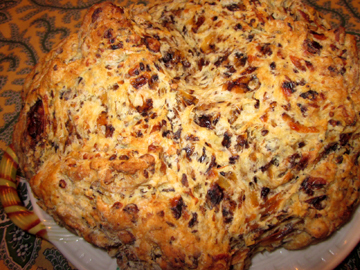 As soon as I saw Cabot’s Cheddar Soda Bread I knew it would be just the thing to serve with corned beef and cabbage or Irish beef or lamb stew. I have changed the recipe a little, of course. 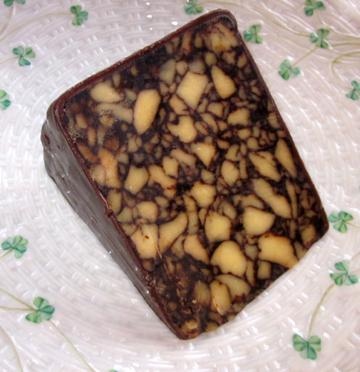 First, I upped the Irish ante by using Irish cheddar—laced with porter. The marbled cheese gave the bread a gorgeous mottled look. The original cheddar might taste sharper, but this version still had lots of cheesiness. I can’t wait to try this cheese in my Irish cheese fondue. 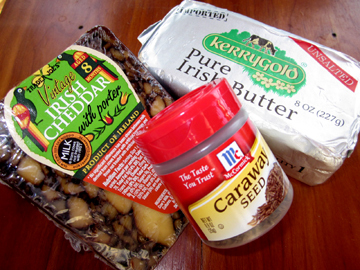 Second, I switched Cabot’s salted butter to unsalted (there’s plenty of sodium in this recipe without more in the butter—and I say this as a girl who loves her salt) and used Kerrygold Irish butter. 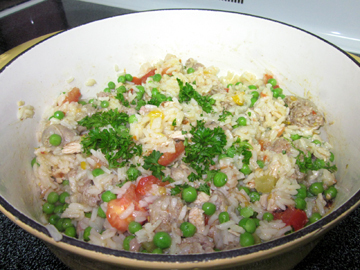 Third, I threw in some caraway seeds. They are often used in soda bread. 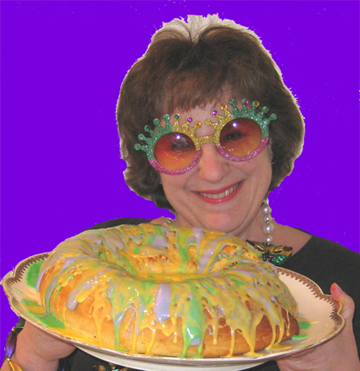 I find them a little strong in sweet breads, but they complement this savory recipe beautifully. Enjoy—but eat sparingly. This bread is very filling. And if you’re in Alexandria, Virginia, Thursday night, come sing along with me and the Montebello Singers…. Preheat the oven to 375 degrees. Lightly grease a cookie sheet or line it with a silicone mat. In a medium bowl whisk together the flour, baking powder, baking soda, salt, and caraway seeds. Stir in the cheese and blend well. In a small bowl or measuring cup, whisk together the buttermilk and the egg. Stir them gently into the dry ingredients. Turn the mixture onto a lightly floured board and knead it a few times, until it holds together into a slightly flattened ball. Pop your ball onto the prepared cookie sheet. You may cut a cross in the center, but my cutting wasn’t very successful so I would leave well enough alone. Bake until the loaf has light brown spots and a toothpick inserted into the center comes out clean—35 to 40 minute or so. Slice into small wedges (12 to 14). Did I mention that I like to wear green?